This is one of my favorite paintings. 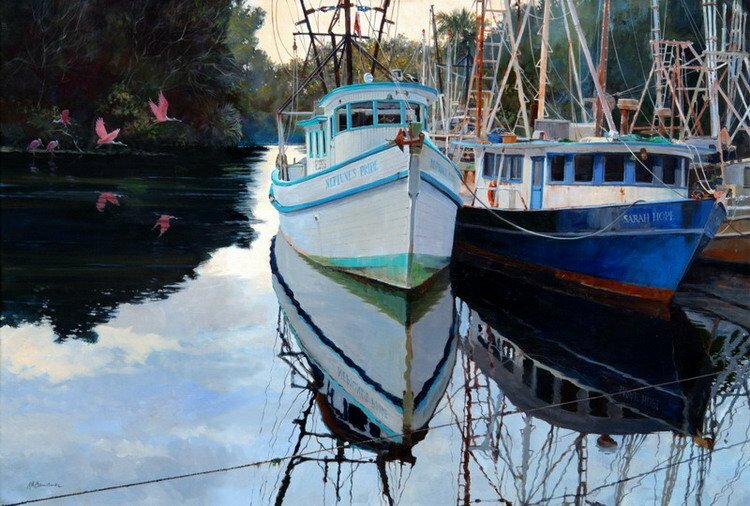 It was done on the quiet waters of the Withlacoochee River near Yankeetown, Florida. Roseate spoonbills are taking flight on the left and the two shrimp boats are moored more than usual because of high fuel prices. Many of these boats now are seldom or not used at all. It appeared the boat on the far right may have been taking on a bit of water as it was listing somewhat. 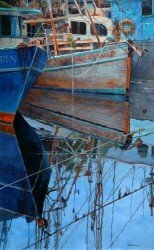 The colors are subtle and warm with lots of reflection of the sky and boats in the placid waters.